Collagen induction therapy, also known as microneedling RF or skin needling, is a cosmetic procedure that involves repeatedly puncturing the skin with tiny, sterile needles. The end product is a tightened, rejuvenated and glowing skin. Dermapen is a very popular dermatology microneedling treatment device that has been embraced all over the world. With over 6,000+ practitioners worldwide adding Dermapen to their practise specifically because of its effectiveness and efficiency when it comes to handling common skin problems like stretch marks, ageing, wrinkles, fine lines, hair loss, acne scars, hyperpigmentation and so much more. Lasermed is no different. In fact, practitioners are constantly coming up with new treatments and ways to use the Dermapen microneedling pen. Dermapen employs the traditional Chinese technique for acupuncture only that here; the targeted result is not to reduce pain but rather to improve the skin appearance. Basically, a Dermapen has 12 needles on the very tip and these 12 needles are the ones that are used to puncture the top layer of the skin as the Dermapen glides over the area being treated. 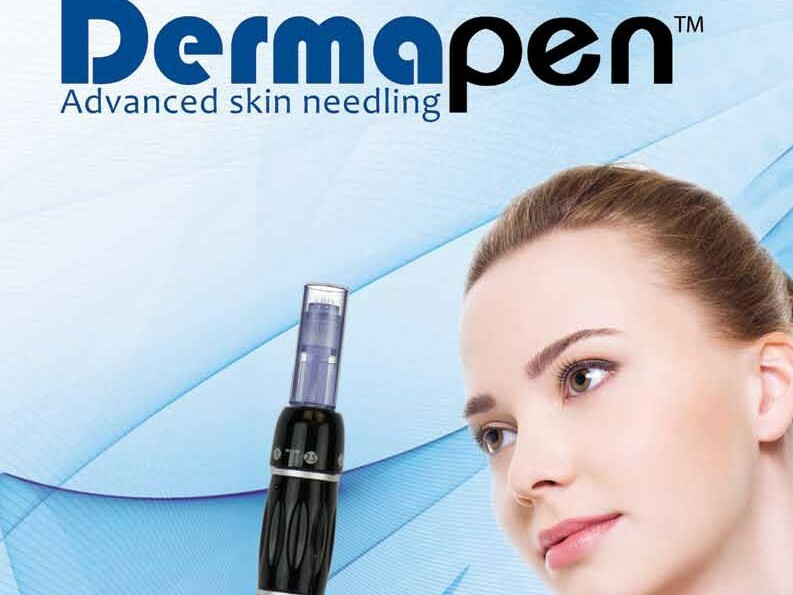 Usually, the Dermapen will be positioned vertically over the skin and when it is turned on, a motor that is found inside the pen will start making the needles to move rapidly back and forth on the skin surface creating the punctures and these needles have been created in such a way that they can rotate in a slight way. These punctures created in the process are usually aimed at opening up the pores for a period of time only. When a person hurts themselves, the skin will generally initiate skin repair by stimulating growth factors that will, in turn, lead to the generation of collagen and elastin. Therefore, when the punctures are made using the Dermapen, the skin will treat the punctures as wounds and therefore initiate healing. This means that micro-needling tend to trick the skin to produce collagen and elastin to promote ‘healing’ and the effect will be a rejuvenated skin. Dermapen is used mostly for face wrinkles, scars, stretch marks and facial lines. When one is injured and the skin forms a scar, or if they have a stretch mark the body will treat these as though that area was repaired. Therefore having the punctures created in the scar tissue will cause the skin to initiate healing and, therefore, the damaged skin will tend to get eliminated and replaced with new skin. For wrinkles and face lines, basically, the produced collagen and elastin will cause the skin to thicken and also tighten leaving the skin looking youthful. Generally, Dermapen has been effective and quite advantageous over other skin treatment procedures. This has seen to it that its popularity keeps growing by the day.